JOHNSON PERFORMED TO A MASSIVE 19,000 PLUS FANS ON SATURDAY FOLLOWING AN INDUSTRY PACKED SHOW AT NASHVILLE’S 3RD AND LINDSLEY. 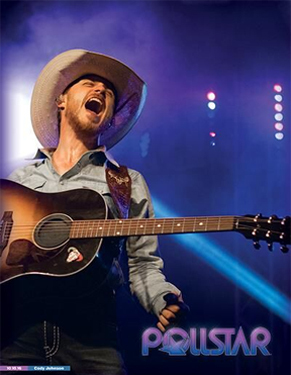 Rising star Cody Johnson continues to make headlines (literally), as he lands the coveted cover of Pollstar during IEBA 2016. The International Entertainment Buyers Association gathered in Nashville over the weekend for its three-day annual conference, which wrapped last night. It doesn’t take much digging to understand why this indie powerhouse landed the cover of Pollstar. He has sold over 500,000 hard concert tickets in less than two years, while crisscrossing the nation. Johnson regularly sells out venues out West in California, Arizona and Colorado as well as Mississippi, Tennessee, Arkansas, Louisiana and Nebraska to name just a few. His staggering ticket sales in every corner of the nation and explosive stage presence have become the talk of the town. Johnson performed to an intimate and SOLD OUT crowd of industry veterans and fans last Thursday night in Nashville at 3rd and Lindsley. He played another SOLD OUT show last Friday night at George’s in Fayetteville, AR. While industry insiders continued to gather at the IEBA conference, Johnson continued doing what he does best - performing. 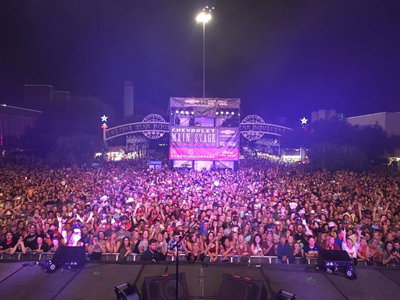 Johnson lit up the night as he and his rowdy band rounded out the weekend playing for yet another massive crowd of over 19,000 fans on Saturday. Promoter Glenn Smith raved about Johnson and his electrifying performance. Johnson will continue his tour this weekend making stops in Kansas, Oklahoma and Texas before heading down to Mississippi next week.